As a working artist, I always strive to innovate and keep my work fresh. In order to do this, I experiment a lot. Sometimes the payoff is immediate, and sometimes it takes longer to show up in my work. The less successful experiments I do tend to kick around my gallery for a long time. I am currently working on the final stages of a major life change for me. I moved to a different state earlier this month, and I am currently finishing up one of the hardest parts of that – setting up house. As part of this move, I have been taking stock of the work I have that is kicking around my home. Prototypes and experiments that have never seen the light of day before now. It isn’t bad work, any of it, but it was a series of stepping stones more than a destination for me. A lot of artists don’t want anyone to ever see any piece of their work that isn’t absolutely technically perfect. In theory, I disagree with that because this construct can prevent artists from putting good work out. If you want to be an artist it is okay to make work only for yourself, but if your goal is to become a working artist and no one knows you make art, doesn’t that kind of defeat the point? However, in action I have many many pieces that are these stepping stones. There is feeling and intention underneath of them, they just aren’t the destination I was heading for. I often tell people that all art is important, and so with an eye towards that, and towards making room in my new studio, I have started listing some of these one-offs in my Etsy shop. I started yesterday with a simple piece. It is wool felt stitched in layers on top of a hand-dyed ocean of cotton. 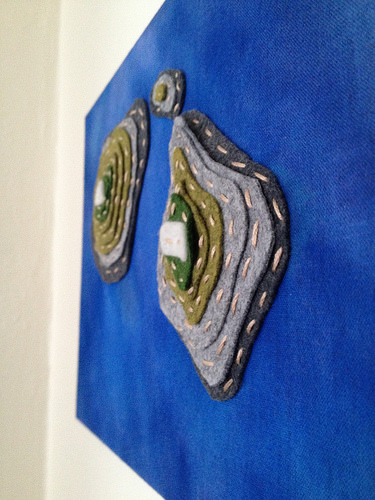 It is a topographic depiction of an atoll that I did with an eye towards experimenting with adding dimension to a flat surface, creating texture on fabric with ink, and constructing things with solid felt. Overall, I am very happy with it. It led to some texture work I did in the background of a small series of mixed media pieces, and it improved my construction techniques for my felt art-jewelry. So tell me, do you have any experiments that are hiding in a back closet just because they were the stepping stone and not the destination? Why don’t you take them out and show them to the world? !